BEAUTIFUL, the photo and the message! I wish everyone could! This shot takes us make to the real meaning of Christmas! So precious! You should frame that or make your Christmas next year. "He's the reason for the season." 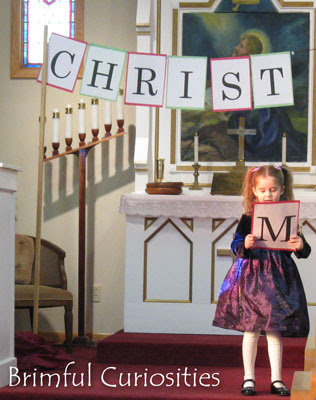 I love that picture - and what a good message to us all during Christmas time! Hope you and your family have a wonderful Christmas!! I love her dress! The little letter she's holding up is fun! Great photo. That says it all! Merry Christmas! This is a great picture and your daughter is absolutely adorable! Merry CHRISTmas! Lovely photo. I love the light on the little girl's face. This is so adorable - love it! A proud moment for her parents I'm sure. Merry Christmas to you and your lovely family.